In the South, people use potato salad as a barometer for how clean your kitchen is and your culinary prowess. 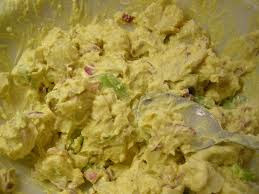 If you can "throwdown" on potato salad, people will eat nearly anything you cook. Not everyone will eat just "anybody's" potato salad. People are picky and finicky when it comes to this comfort food. And the list goes on. And so does the list of ingredients. My family's 54th annual family reunion was in late August and this year was hosted by my branch of the family tree. My mother, her siblings, her first cousins and I orchestrated all of the events. I was responsible for quite a few things, but the main thing was to make 25 lbs of potato salad for 100 people. I won't list a recipe here, but I will leave some tips. *Cut your potatoes in 1-inch pieces before cooking them. You want them in bite-sized pieces; Not so big you need a knife, but not so small they break apart and make mashed potatoes when you're mixing all of the ingredients. *Make your dressing first. Mix your mayonnaise, vinegar and seasonings while your potatoes are baking, boiling, grilling. *Pour your dressing over the potatoes while they are hot. The creamy, seasoned, vinegary goodness will soak into the potatoes and make the entire melange of potato salad taste its best this way. *Nothing says "I didn't plan this out well" more than warm potato salad (unless it's German) so make sure you make your potato salad the night ahead so it can be chilled properly for the next day.